*Wireless smart voice doorbell, talk with visitor via two-way voice intercom,which let you know who visits your home and talk to them and let them know I&apos;m coming, please wait. 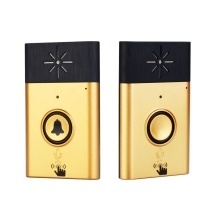 *1 receiver and 1 push button,talk between receiver and push button via wireless connection within a large range(outdoor bell:200m indoor bell:5-50m without any obstacle),stable transmission signal to make voice clear. *It&apos;s widely used for office and house, get know who is outside, and convenient for the elder who needs much more time to open the door, very practical.